3dRose Danita Delimont - Fountains - The Moor Fountain, Piazza Navona, Rome, Latium, Italy - 18 x 27 inch Garden Flag (fl_277631_2) | Fountain City Art Ctr. On Sale Now! 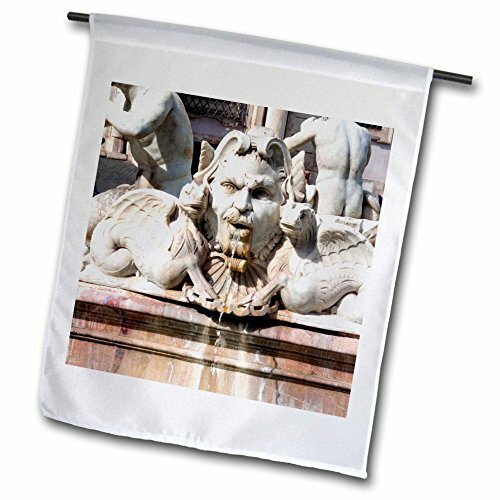 Save 10% on the 3dRose Danita Delimont - Fountains - The Moor Fountain, Piazza Navona, Rome, Latium, Italy - 18 x 27 inch Garden Flag (fl_277631_2) by 3dRose at Fountain City Art Ctr.. MPN: fl_277631_2. Hurry! Limited time offer. Offer valid only while supplies last. The Moor Fountain, Piazza Navona, Rome, Latium, Italy Flag is a creative way to celebrate all year round by adding a little bit of color and fun. The Moor Fountain, Piazza Navona, Rome, Latium, Italy Flag is a creative way to celebrate all year round by adding a little bit of color and fun. Made of 100% single-ply semi-opaque polyester with the image printed on one side; a lighter image will be visible on the backside. Hang using a pole, on the wall, ceiling, banister, and door or anywhere you feel the need to add a splash of color. Hanging hardware/pole not included.